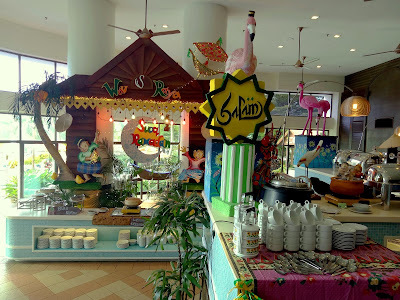 Flamingo Hotel By The Beach, Penang is a 4-star beachside resort at Tanjung Bungah. The primary restaurant here is Flamingo Café. 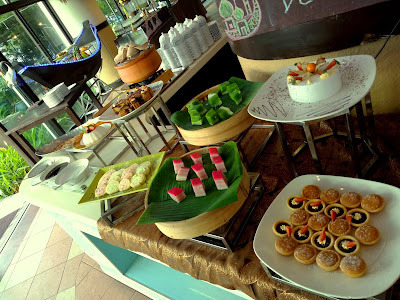 This year, the Ramadan buffet dinner is themed "Wau Ramadhan Buffet". 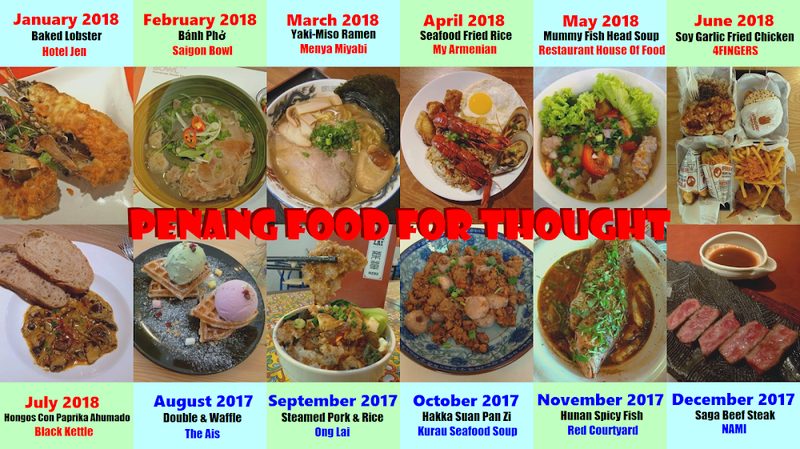 Dinner is served every evening from 17 May 2018 to 14 June 2018. Muslims typically break fast by taking several pieces of kurma. 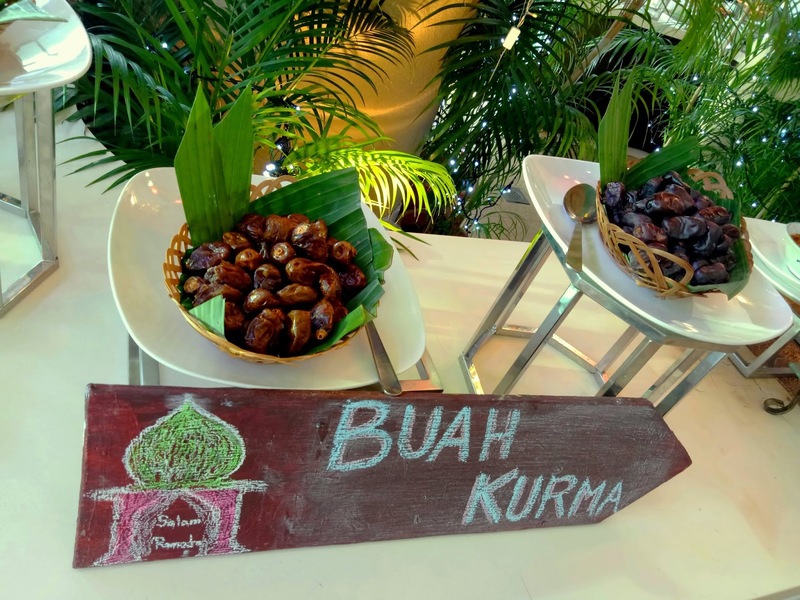 The sweetness of palm dates stimulates the taste buds and allows one's appetite to hit the ground running. There are several ways to start the actual meal. Bubur Lambuk Daging is a Malay rice porridge made from beef and spices. 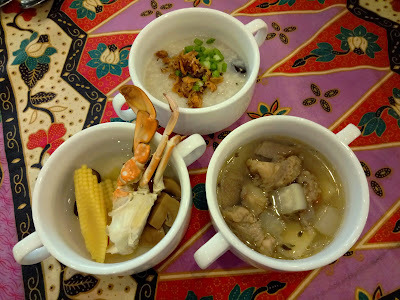 Meanwhile, Sup Ketam & Jagung is prepared from flower crabs, button mushrooms and baby corn. Last but not least, Sup Kambing contains chunks of mutton, daikon and potato. Flamingo Café features a grilling station next to the swimming pool. 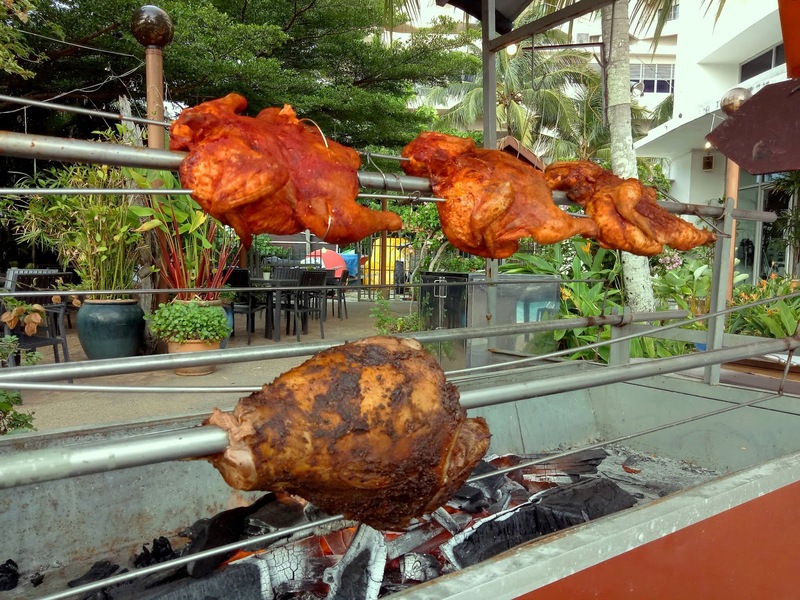 During Ramadan, Kambing Bakar and Tandoori Ayam Golek are cooked over a charcoal grill, imparting an appetizing touch of toastiness in the process. In addition, grilled fish and Mongolian grill are also available. 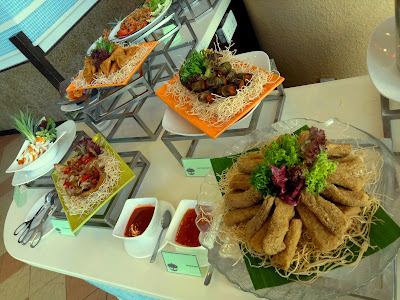 The fried food corner produces deep-fried durian, cempedak, banana and sweet potato in crispy batter. 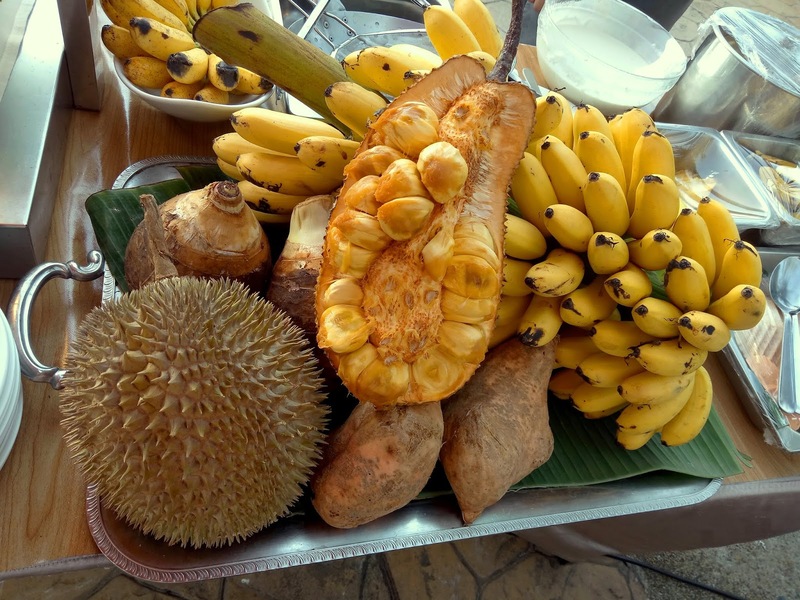 I am particularly fascinated with the durian and cempedak versions. As for Pais Ikan Daun Pisang, doryfish is seasoned with spices and baked to golden perfection. 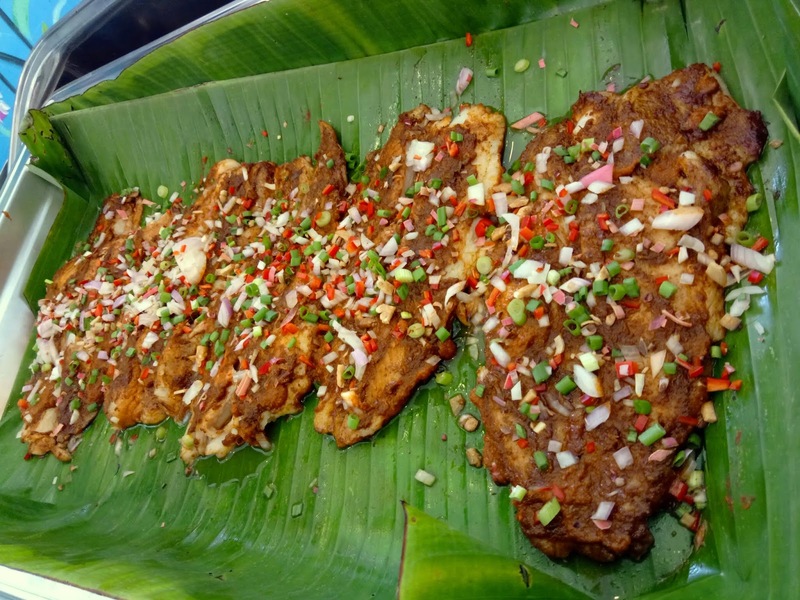 Presented over banana leaves, the delicate fillets are served with red chili peppers, scallions and shallots. 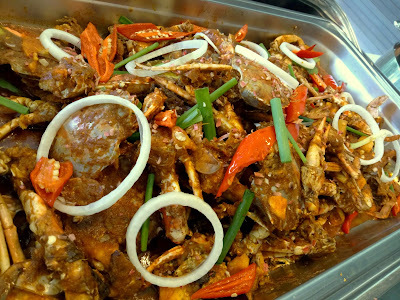 If you are fond of crabs, Ketam Masak Masam Pedas should suit your palate. Fried with sour-and-spicy seasonings, the flower crabs do not offer much meat. Instead, the crabs are meant to enrich the taste of the sauce. The signature dish this evening is Ketupat Sotong Berkuah Kacang. In this dish, the mantle (body) of each squid is filled with rice, and then cooked with satay-style sauce. The stuffed rice really helps to tone down the level of spiciness. 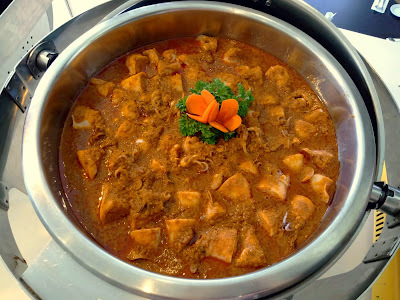 Kari Nangka Muda Masak Ikan Bilis is another spicy dish, although it is not nearly as peppery as the previous one. 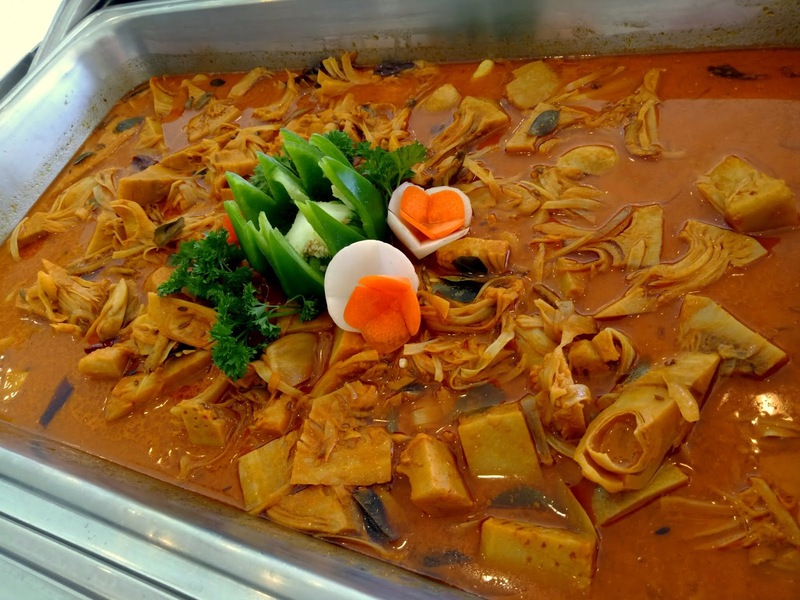 The two key ingredients are ikan bilis (anchovies) and nangka (jackfruit). 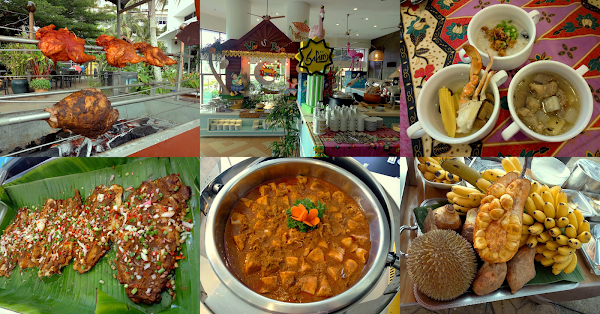 The jackfruit is quite salty, so it is best eaten with rice. Telur Sosej is cooked with sausages, onions and red chili peppers. The omelette delights my taste buds in spite of its simplicity. Pasembur is a popular street food in Penang and is often sold in roadside stalls. 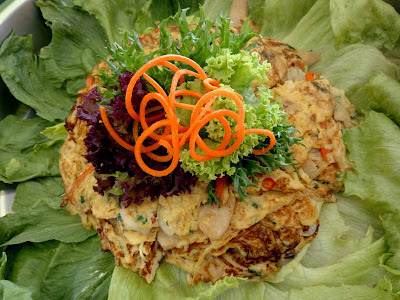 The ingredients are typically prawn fritters, hard-boiled eggs, tofu, boiled potatoes, cucumber and sengkuang (jicama). 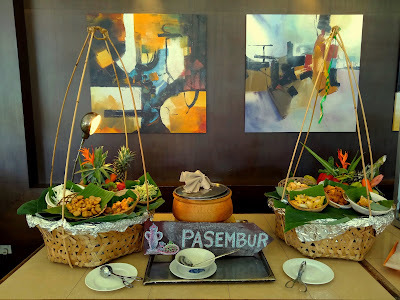 Pasembur is often dressed with sweet-and-spicy peanut sauce. Ulam-ulaman is an assortment of vegetables such as daun selom (selom leaves), jantung pisang (banana flower), kacang botol (winged beans), petai (stink beans) and more. 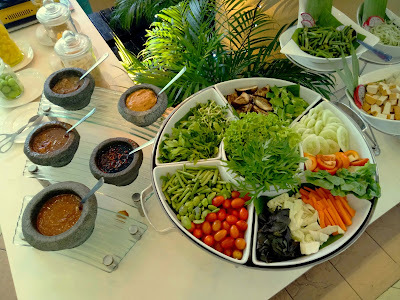 These raw vegetables are typically eaten with powerful condiments like tempoyak (fermented durian paste), cincalok (salty shrimp paste) and sambal belacan (spicy shrimp paste). 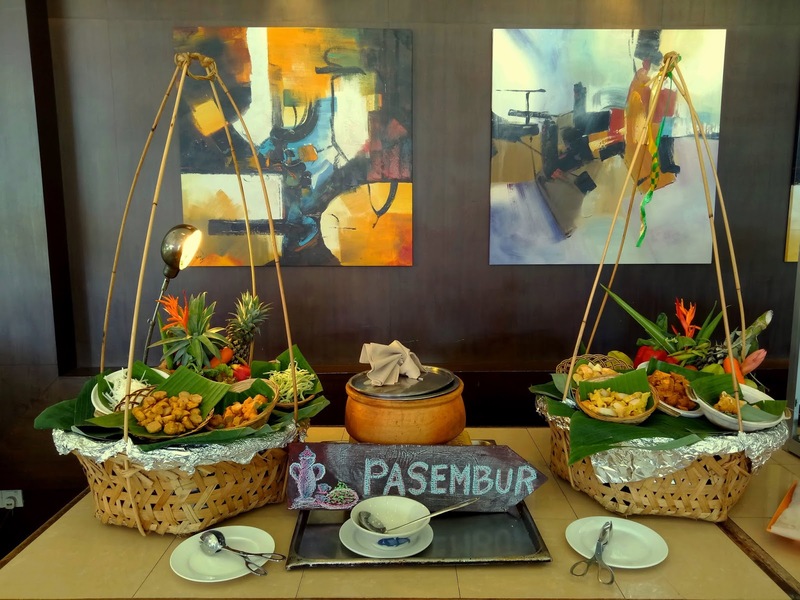 In addition, salted egg and salted fish are also available. As for kerabu (Malay salad), popular ones are Kerabu Perut (beef stomach salad) and Kerabu Taugeh Dengan Kerang (bean sprout and cockle salad). 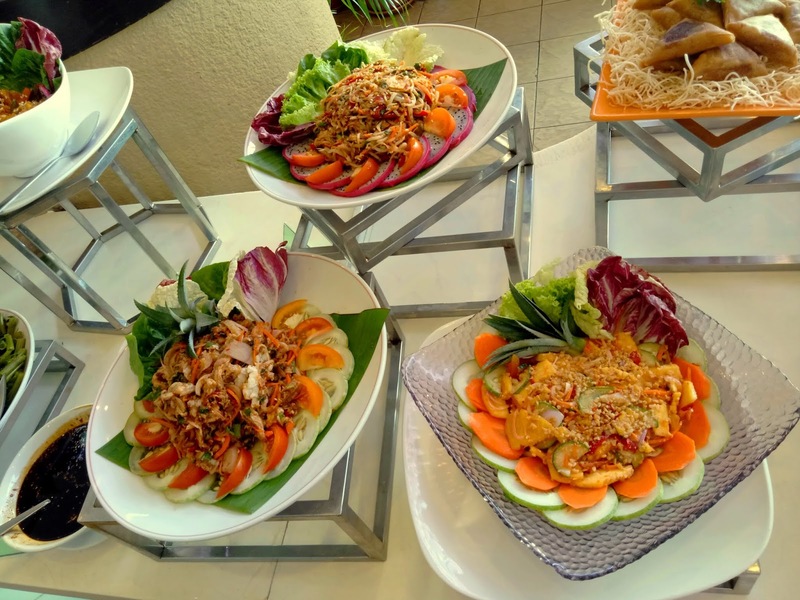 Meanwhile, pickled salads include Acar Timun (pickled cucumber) and Acar Rampai (pickled cucumber & carrot). Keropok Lekor is a popular snack from Terengganu. These deep-fried fish crackers have a chewy texture and are usually eaten with sweet-spicy sauce. Other fried snacks include Ayam Pandan Goreng and Samosa Ubi Goreng. 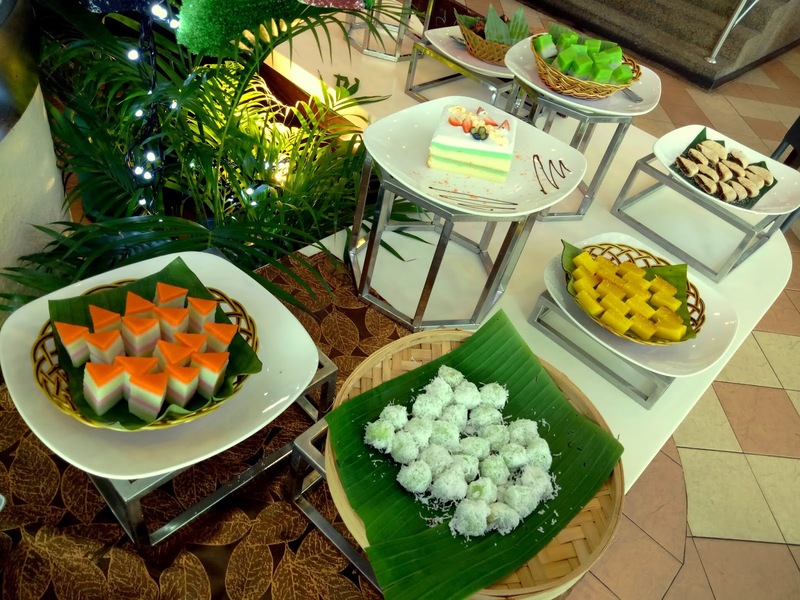 The variety of Malay kuih at Flamingo Hotel is not as plentiful as some other hotels. Available types are kuih lapis, kuih talam pandan, kuih bingka ubi, onde-onde and abuk-abuk. In addition, there are also Western-style cakes and tartlets. Sago Gula Melaka is usually eaten with gula melaka (palm sugar) and coconut milk. I am also fascinated by Pengat Pisang, but it turns out to be too sweet for me. Finally, Ais Kacang is always a good way to conclude a heavy meal. 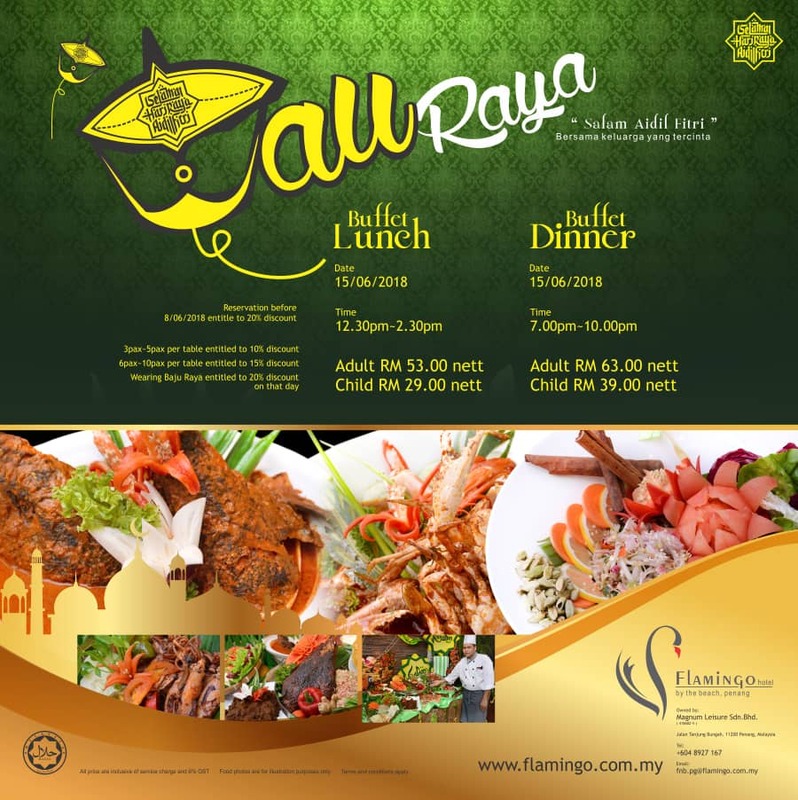 The Ramadan buffet dinner at Flamingo Hotel costs RM75.00 net per adult and RM45.00 net per child. 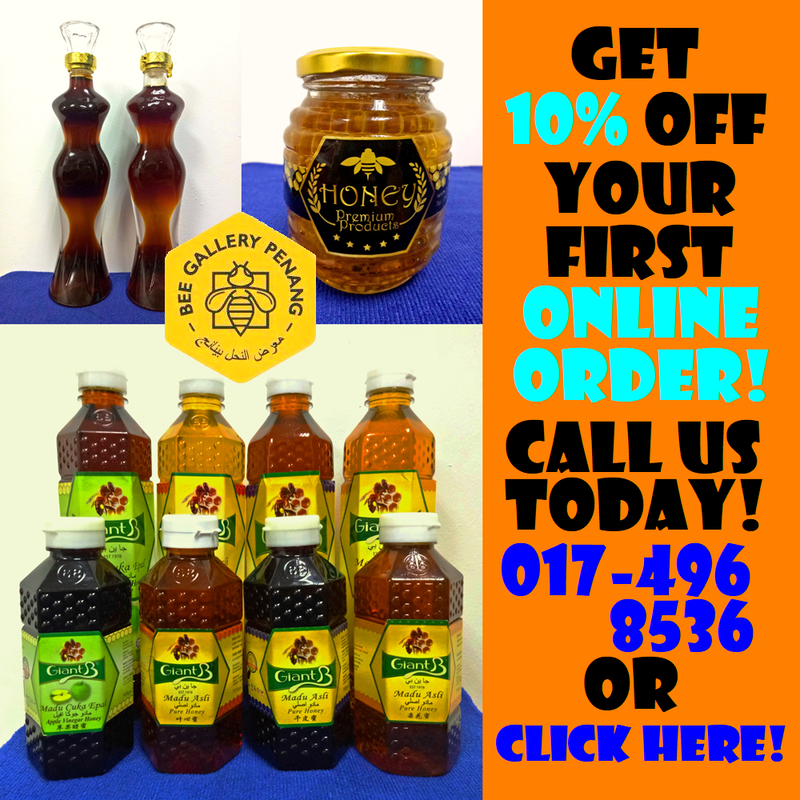 On weekends (Friday, Saturday and Sunday), the price is RM85.00 and RM49.00 respectively. In addition, the hotel is also serving buffet lunch and dinner on Hari Raya Aidilfitri (15 June 2018). Directions: Traveling westbound on Jalan Tanjung Bungah, drive past the pedestrian bridge near Dalat International School. Make a U-turn at the next traffic light-controlled junction and immediately turn left to Flamingo Hotel. Flamingo Café is one level below the lobby. The hotel provides complimentary outdoor and indoor parking.